نادری قره قشلاق, سهیلا, جمیلی, شهلا, فاطمی, محمد جواد, شریفی, علی محمد, نورانی, محمد رضا. (1397). بررسی ساختار شیمیایی کلاژن ماهی سفید (Rutilus Kutum) از دریای خزر و کلاژن ماهی قباد Scomberomorus guttatus) ( از خلیج فارس. فصلنامه محیط زیست جانوری, 10(3), 241-250. سهیلا نادری قره قشلاق; شهلا جمیلی; محمد جواد فاطمی; علی محمد شریفی; محمد رضا نورانی. "بررسی ساختار شیمیایی کلاژن ماهی سفید (Rutilus Kutum) از دریای خزر و کلاژن ماهی قباد Scomberomorus guttatus) ( از خلیج فارس". 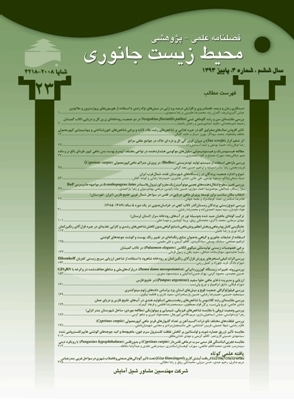 فصلنامه محیط زیست جانوری, 10, 3, 1397, 241-250. نادری قره قشلاق, سهیلا, جمیلی, شهلا, فاطمی, محمد جواد, شریفی, علی محمد, نورانی, محمد رضا. (1397). 'بررسی ساختار شیمیایی کلاژن ماهی سفید (Rutilus Kutum) از دریای خزر و کلاژن ماهی قباد Scomberomorus guttatus) ( از خلیج فارس', فصلنامه محیط زیست جانوری, 10(3), pp. 241-250. نادری قره قشلاق, سهیلا, جمیلی, شهلا, فاطمی, محمد جواد, شریفی, علی محمد, نورانی, محمد رضا. بررسی ساختار شیمیایی کلاژن ماهی سفید (Rutilus Kutum) از دریای خزر و کلاژن ماهی قباد Scomberomorus guttatus) ( از خلیج فارس. فصلنامه محیط زیست جانوری, 1397; 10(3): 241-250. کلاژن دارای کاربردهای فراوانی در زمینه داروسازی و پزشکی، تهیه محصولات بهداشتی و آرایشی و صنایع غذایی می­باشد. در سال­های اخیر توجه زیادی به جداسازی کلاژن از موجودات دریایی شده است که علت آن عدم محدودیت استفاده از آن در رژیم غذایی و عدم ایجاد خطر ابتلا به بیماری­های مسری می­باشد. در این مطالعه به استخراج کلاژن ازپوست ماهی سفید از ماهیان اقتصادی دریای خزر و ماهی قباد یکی از گونه­های تن ماهیان خلیج فارس پرداخته شده است. کلاژن پوست ماهی سفید و ماهی قباد به­روش اسید و باز استخراج گردید و سپس به­وسیله Pico.Tag ، SDS-PAGE، FTIR و اسپکتوفوتوگرافی UV مورد ارزیابی قرار گرفتند. نتایج براساسSDS-PAGE و ترکیبات اسیدهای آمینه نشان دادند که کلاژن پوست هر دو ماهی کلاژن نوع I و از دو زنجیره α (1α و2α) با وزن مولکولی kDa 130 و مقدار جرِئی β تشکیل شده است. هم­چنین تجزیه و تحلیل FTIR، ترتیبات مارپیچی از هر دو کلاژن را نشان داد و اسپکتروفتومتری UV در هر دو نمونه کلاژن پوست ماهی سفید و ماهی قباد حداکثر جذب را در 240 نانومتر نشان داد. میزان کلاژن استخراج شده از پوست ماهی سفید 15/6% و ماهی قباد 14/5% بود. تجزیه و تحلیل اسیدآمینه در کلاژن­های استخراج شده، مقدار بالایی از گلایسین را در هر دو نمونه کلاژن، ماهی سفید 182/5 residues بر 706/1 residues و ماهی قباد 188/6 residues بر 706/1 residues را نشان داد که آن یک سوم از کل اسیدهای آمینه محاسبه گردید و هم­چنین مقدار پرولین به­عنوان یک اسیدآمینه منحصر به­فرد در کلاژن ماهی سفید 89/6 residues بر 706/1 residues و در ماهی قباد residues 86/8 بر 706/1 residues بود. رحیمی، م.؛ خواجوی، ر. و مهدوی­هزاوه، م.، 1389. تولید کلاژن نوع اول و به­کارگیری آن در مصارف پزشکی. مجله علوم پزشکی دانشگاه تهران. شماره 4، صفحات 246 تا 251. رضوی­صیاد، پ.، 1369. ارزیابی ذخایر و مدیریت ماهیان استخوانی و اقتصادی دریای مازندران. شرکت سهامی شیلات ایران. قاسم­اف، س.، 1372. دریای خزر. ترجمه: عادلی، ا.، 1379. مرکز تحقیقات شیلاتی انزلی.56 صفحه. کازانچف، ا.ن.، 1981. ماهیان دریای خزر و حوزه آبریز آن. ترجمه: شریعتی، ا.، 1371. شرکت سهامی شیلات ایران. 171 صفحه . Abdoli, A., 1999. The Inland Water Fishes of Iran. Natural and Wild Life Museum of Iran, Tehran. pp: 198-200. Abedin, M.Z. ; Karim, A.A.; Gan, C.Y. ; Ghazali, F.C. ; Barzideh, Z.; Zzaman, W. and Zaidul, I.S.M., 2015. Identification of angiotensin I converting enzyme inhibitory and radical scavenging bioactive peptides from sea cucumber (Stichopus vastus) collagen hydrolysates through optimization. International Food Research Journal. Vol. 22, No. 3, pp: 1074-1082. AlizadehNodeh, M.; Moradi, Z. and Nourani, MR., 2014. Isolation and Purification of Collagen from the Skin of Black Pomfret (Parastromateus niger) for Tissue Engineering Purpose. Journal of Appleid Tissue Engineering. Vol. 1, No. 1, pp: 18-21. Barzideh, Z.; Latiff, A.A.; Gan, C.Y. ; Abedin, M. and Alias, A.K., 2014. ACE inhibitory and antioxidant activities of collagen hydrolysates from the ribbon jelly fish (Chrysaora sp.). Food Technology and Biotechnology. Vol. 52, No. 4, pp: 495-504. Balian, G.; Bowes, JH. ; In, A.G.; Ward, K. and Courts, A., 1977. The science and technology of gelatin. London: Academic Press. pp: 1-30. Bernardini, R.D. ; Mullen, A.M.; Bolton, D.; Kerry, J.; O’neill, E. and Hayes, M., 2012. Assessment of the Angiotensin-I-converting enzyme (ACE-I) inhibitory and antioxidant activities of hydrolysates of bovine brisket sarcoplasmic proteins produced by papain and characterisation of associated bioactive peptidic fractions. Meat Science. Vol. 90, No. 1, pp: 226-235. Bidlingmeyer, B.A. ; Cohen, S.A. and Tarvin, L., 1984. Rapid analysis of amino acids using pre-column derivatisation. Journal of Chromatography. Vol. 336, pp: 93-104. Cao, H. and Xu, S.Y., 2008. Purification and characterization of type II collagen from chick sternal cartilage. Food Chem. Vol. 108, pp: 439-445. Collette, B.B. ; Carpenter, K.E. and Niem, V., 2001. The Living Marine Resources of the Western Central Pacific, Scombridae, Tunas (also, albacore, bonitos, mackerels, seerfishes and Wahoo). FAO Species Identification Field Guide for Fishery Purposes. FAO Publication, Rome. pp: 3721-3756. Ding J.F. ; Li, Y.Y. ; Xu, J.J.; Su, X.R. ; Gao, X. and Yue, F.P., 2011. Study on effect of jelly fish collagen hydrolysate on anti-fatigue and anti-oxidation. Food Hydrocolloids. Vol. 25, No. 5, pp: 1350-1353. Duan, R.; Zhang, J.; Du, X.; Yao, X. and Konno, K., 2009. Properties of collagen from skin, scale and bone of carp (Cyprinus carpio) food chemistry. Vol. 112, pp: 702-706. Edwards, H.G.M. ; Farwell, D.W.; Holder, J.M. and Lawson, E.E., 1997. Fouriertransform Raman spectroscopy of ivory: II. Spectroscopic analysis and assignments. Journal of Molecular Structure. Vol. 435, pp: 49-58. Eastoe, J.E., 1958. The Amino Aside Composition of Fish Collagen and Gelatin. The British Gelatin and Glue Research Association, 2α Dalmeny Avenue, London. No. 7, 57 p.
Friess, W., 1998. Collagen biomaterial for drug delivery. Eur. J. Pharm. Biopharm. Vol. 45, pp: 113-136. Foegeding, E.; Lanier, T.C. and Hultin, H.O., 1996. Characteristics of edible muscle tissue. In O. R. Fennema (Ed. ), Food chemistry (3rd ed.,). New York: Marcel Dekker. pp: 879–942. Gómez-Guillén, M.C. ; Giménez, B.; López-Caballero, M.A. and Montero, M.P., 2011. Functional and bioactive properties of collagen and gelatin from alternative sources: A review. Food Hydrocolloids. Vol. 25, No. 8, pp: 1813-1827. Hema, G.S. ; Shyni, K.; Suseela Mathew, R.; Ninan, G. and Lakshmanan, P.T., 2013. A simple method for isolation of fish skin collagen- biochemical characterization of skin collagen extracted from Albacore Tuna (Thunnus Alalunga), Dog Shark (Scoliodon Sorrakowah), and Rohu (Labeo Rohita). Scholars Research Library, Annals of Biological Research. Vol. 4, No. 1, pp: 271-278. Jayakrishnan, A. and Jameel, S.R., 1996. Glutaraldehyde as a fixative in bioprostheses and drug delivery matrices. Biomaterials. Vol. 17, pp: 471-484. Jongjareonrak, A.; Benjakul, S.; Visessanguan, W.; Nagai, T. and Tanaka, M., 2005. Isolation and characterisation of acid and pepsin-solubilised collagens from the skin of Brownstripered snapper (Lutjanus vitta). food chemistry. Vol. 93, pp: 475-484. Jongjareonrak, A.; Benjakul, S.; Visessanguan, W. and Tanaka, M., 2005. Isolation and characterization of collagen from big eye snapper (Priacanthus marcracanthus) skin. Journal of the Science of Food and Agriculture. Vol. 85, pp: 1203-1210. Kim, S.K. and Mendis, E., 2006. Bioactive compounds from marine processing byproducts a review. Food Research Intl. Vol. 39, pp: 383-393. Lafarga, T. and Hayes, M., 2014. Bioactive peptides from meat muscle and by-products: generation, functionality and application as functional ingredients. Meat Science. Vol. 98, No. 2, pp: 227-239. Love, R.M. ; Yamaguchi, K.; Creach, Y. and Lavety, J., 1976. The connective tissue and collagen of cod during starvation. Comparative Biochemistry and Physiology Part B. Vol. 55, pp: 487-492. Lee, C.H. ; Singla, A. and Lee, Y., 2002. Biomedical applications of collagen. Int. J. Pharm. Vol. 221, pp: 1-22.
wang, L.; An, X.; Xin, Z.; Zhao, L. and Hu, Q., 2007. Isolation and Characterization of Collagen from the Skin of Deep Sea Red fish (Sebastes mentella). Journal of food Science. Vol. 72, pp: 450-455. Liu, H.Y. ; Li, D. and Guo, S.D., 2007. Studies on collagen from the skin of channel catfish (Ictalurus punctaus). Food Chemistry. Vol. 101, pp: 621-625. Montero, P.; Borderias, J.; Turnay, J. and Leyzarbe, N.A., 1990. Characterization of hake (Merluccius merluccius L.) and trout (Salmo irideus Gibb) collagen. Journal of Agricultural and Food Chemistry. Vol. 38, pp: 604-609. Muyonga, J.H. ; Cole, C.G.B. and Duodu, K.G., 2004. Characterization of acid soluble collagen from skins of young and adult Nile perch (Lates nilotics). Food Chemistry. Vol. 85, pp: 81-89. Nagai, T. and Suzuki, N., 2000. Isolation of collagen from fish waste material skin, bone and fins food chemistry. Vol. 68, pp: 277-281. Nagai, T.; Araki, Y. and Suzuki, N., 2002. Collagen of the skin of ocellate puffer fish (Takifugu rubripes). Food Chemistry. Vol. 78, pp: 173-177. Ogawa, M.; Portier, R.J.; Moody, M.W. ; Bell, J.; Schexnayder, M.A. and Losso, J.N., 2004. Biochemical properties of bone and scale collagens isolated from the subtropical fish black drum (Pogonia cromis) and sheepsheadseabream (Archosargus probato cephalus). food chemistry. Vol. 88, pp: 495-501. Pachence, J.M., 1996. Collagen-Based Devices for Soft Tissue Repair. J. Biomed. Res. (Applied Biomaterials). Vol. 33, pp: 35-40. Payne, K.J. and Veis, A., 1988. Fourier transform IR spectroscopy of collagen and gelatin solutions: Deconvolution of the Amide I band for conformational studies. Biopolymers. Vol. 27, pp: 1749-1760. Palpandi, C.; Ramasamy, P.; Rajinikanth, T.; Vairamani, S. and Shanmugam, A., 2010. Extraction of Collagen from Mangrove Archeaogastropod Nerita (Dostia) crepidularia Lamarck, 1822. American-Eurasian Journal of Scientific Research. Vol. 5, No. 1, pp: 23-30. Saiga, A.; Iwai, K.; Hayakawa, T.; Takahata, Y.; Kitamura, S.; Nishimura, T. and Morimatsu, F., 2008. Angiotensin I-converting enzyme inhibitory peptides obtained from chicken collagen hydrolysate. Journal of Agricultural and Food Chemistry. Vol. 56, No. 20, pp: 9586-9591. Shahidi, F., 1994. Seafood processing by-products. In: Shahidi F, Botta JR, editors. Seafoods chemistry, processing, technology and quality. Glasgow: Blackie Academic Professional. pp: 11-26. Sato, K.; Yoshinaka, R.; Sato, M. and Ikeda, S., 1986. A Simplified Method for Determining Collagen in Fish Muscle. Bulletin of the japanese society of scientific fisheries. Vol. 52, No. 5, pp: 889-893. Senaratne, L.S. ; Park, P.J. and Kim, S.K., 2006. Isolation and characterization of collagen from brown backed toadfish (Lago cephalus gloveri) skin. Bioresource Technology. Vol. 97, pp: 191-197. Siddeek, M.S.M. ; Fouda, M.M. and Hermosa Jr., G.V., 1999. Demersal fisheries of the Arabian Sea, the Gulf of Oman and the Persian Gulf. Estuar. Coast. Shelf Sci. Vol. 49, pp: 87-97. Sionkowska, A.; Kozłowska, J.; Skorupska, M. and Michalska, M., 2015. Isolation and characterization of collagen from the skin of Brama australis. Int J Biol Macromol. Vol. 80, pp: 605-609. Tylingo, R.; Mania, S.; Panek, R.; Piatek, R. and Pawlowicz, R., 2016. Isolation and Characterization of Acid Soluble Collagen from the skin of African Catfish (Clarias gariepinus), Salmon (Salmo salar) and Baltic Cod (Gadus morhua). J Biotechnol Biomater. Vol. 6, pp: 234-239. Voet, D.; Voet, J. and Pratt, C.F.D.B., 2006. Fundamentos de bioquímica. 3ª Ed. Porto Alegre: Armed. 42 p.
Wang, J.; Wang, Y.; Tang, Q.; Wang, Y.; Chang, Y.; Zhao, Q. and Xue, C., 2010. Antioxidation activities of low-molecular-weight gelatin hydrolysate isolated from the sea cucumber Stichopus japonicus. Journal of Ocean University of China. Vol. 9, No. 1, pp: 94-98. Ward, A.G. and Courts, A., 1977. The Science and Technology of Gelatin. Academic Press, London. 564 p.
Xu, R.; Chen, Y.J. ; Wan, D.R. and Wang, J., 2012. Identification of four Sedum plant medicines by fourier transform infrared spectra. Phcog Mag. Vol. 8, pp: 107-110. Yan, M.; Li, B.; Zhao, X.; Ren, G.; Zhuang, Y.; Hou, H.; Zhang, X.; Chen, L. and Fan, Y., 2008. Characterization of acid-soluble collagen from the skin of walleye pollock (Theragra chalcogramma). Food Chemistry. Vol. 107, pp: 1581-1586. Zhang, J.; Duan, R.; Tian, Y. and Konno, K., 2009. Characterisation of acid-soluble collagen from skin of silver carp (Hypophthalmichthys molitrix). Journal of food chemistry. Vol. 116, pp: 318-322. Zeng, S.K. ; Zhang, C.H. ; Lin, H.; Yang, P.; Hong, P.Z. and Jiang, Z., 2009. Isolation and characterisation of acid-solubilised collagen from the skin of Nile tilapia (Oreochromis niloticus). Journal of food chemistry. Vol. 116, pp: 879-883. Falahatkar, B.; Poursaeid, S.; Ershad Langrodi, H.; Efatpanah, I.; Meknatkhah, B. and Rahmati, M., 2013. Spawning induction in Kutum, Rutilus frisii kutum (Kamensky), with different hormones: Analysis of hormone profiles and induced spawning success., Arch. Pol. Fish. Vol. 21, pp: 271-281. Alberts, B.; Johnson, A.; Lewis, J.; Raff, M. and Roberts, K., 2002. Molecular Biology of the Cell. Garland Science: New York, USA. Van der Rest, M. and Garrone, R., 1991. Collagen family of proteins. FASEB J.Vol. 5, pp: 2814-2823. Prockop, D.J. and Kivirikko, K.I., 1995. Collagens: Molecular biology, diseases, and potentials for therapy. Annu Rev Biochem. Vol. 64, pp: 403-434. Yamada, S.; Yamamoto, K.; Ikeda, T.; Yanagiguchi, K. and Hayashi, Y., 2014. Potency of Fish Collagen as a Scaffold for Regenerative Medicine. Hindawi Publishing Corporation. 8 p.